Consciousness and Human Mind, You Can’t have One Without the Other. Consciousness goes hand in hand with the human mind. Understand the one and you’ll understand the other. Hey, did you realize that the only way to understand is via consciousness and human mind! The Human mind, whatever, you consider it to be, is the capstone of everything on Earth. Consciousness together with human mind are among the greatest enigmas of all times. Yet, they are the basis and key to understanding humankind. Why you are, who I am. And beyond that, why each of us has a human mind and consciousness. Embark on The Explanation and learn why. As this is Audit of the Universe we have discussed the state of the human mind and mental health. However, we are also defining the definitive pieces and contours of our puzzle so we can begin to put it together in Origin of the Universe. After all, if you don’t have the pieces, or have the wrong pieces you’ll never be able to assemble it and display the coherent and complete image, correct? You must establish a solid foundation before constructing the building and roof. Here’s a principle for building anything solidly. An example from a different field: In search engine optimization, we call these key pieces of a website, cornerstone pages, the basic pages for which all the other pages give more precise details, the cornerstone knowledge from which all the other information pages branch out. Before you start, you’ve got to know what those fundamental pages are going to be. And you’ve got to know the single overriding idea, the raison d’être for your website. That’s the capstone page, at the very top, which the limited number of cornerstone pages, on the second level, begin to expand… and so on with more detailed pages at the third and fourth levels. Same with The Explanation. We must establish the lead element, the top ranking feature from which the four cornerstone elements derive. It’s like starting at the top of a pyramid as you can see from the image above. We’re talking about the pyramidion, the capstone. The second row from the top contains the four cornerstones and along with all the other layers of stones they support this one top-level jewel. The crowning stone that all the others develop and point to. 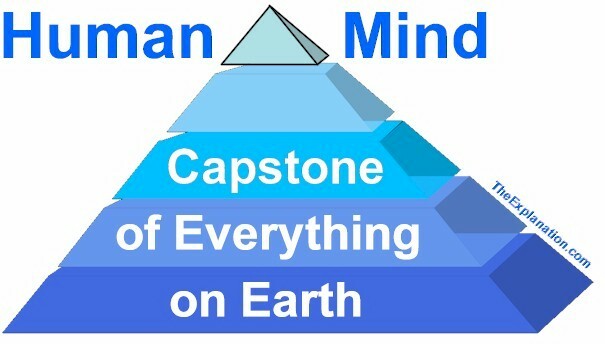 the capstone is the human mind. We have analyzed the body-mind issue with monism and dualism. We have referred to Transhumanism and Artificial Intelligence as proposed for progressing to the next level of ‘super-humans.’ I’ve displayed lists of hundreds of emotions, attitudes, sentiments, and moods and asked you where we can ‘find them?’ Are they in robots? computers? And especially, are they part of the human body and brain? Current science has no explanation for subjective experience. There isn’t even an adequate definition of consciousness. Recent research continues many approaches in attempts to find a brain region that is correlated with basic awareness or consciousness. What I particularly appreciate about Dr. Lieff is his frankness about research and its accomplishments. Subjective experience is directly associated with the mind. If there’s no explanation for the former then there’s no explanation for the latter. He admits that science and research is at a loss to define consciousness. I’m not criticizing either science or medicine or research, I just want you to beware and be very careful when you hear affirmations that say it’s part of the brain, which implies the mind is physical. There is still no understanding of how subjective experience binds together all that is part of our daily experience of awareness. Most events in the brain involve large brain wide circuits traversed in milliseconds. Just this week, a study implied meaning of words is not in a language center, but distributed throughout the entire brain. The same is true for memory, which appears to be very distributed. No brain region simply reflects consciousness. Some regions are correlated with content of awareness. For now, this search will continue with no definition of consciousness or subjective experience. We are left with our every day experience. Please understand what I’m doing here. We’re discussing the individual components of a human being: In Inventory of the Universe chapter 8 and the last chapter (8), of Audit of the Universe: The body which should also include the brain which is an important body organ. Whereas chapter 9 of both Inventory and Audit deal more with the mind. Yes, I’ve separated the mind from the body devoting chapter 9 in both volumes to this ‘separate or not to separate’ issue. Some readers might not see why I’m trying to drive home this point. And true, I won’t be fully clear until we get into Origin of the Universe when I’ll be very clear. I’ve separated the mind from the body and brain and transhumanism and Artificial Intelligence because the mind is an elusive, but oh so vital part of a human being. The controversy that surrounds the body-mind issue should tell you how thorny this unsolved problem is. You are going to see from the next 4 chapters, what I could call the 4 cornerstone chapters, that, without mind it would be impossible to write on the Singularity of Humankind, its Endeavors or How Humankind Functions and Reasons. Simply because without the Human Mind we’d function just like animals. There would be no Humankind Singularity no Endeavors no particular Functioning, no particular Reasoning. Technology is capable of helping us get anywhere, verbalize any thought to any number of people. Each of us alive right now has far more resources than Hawking ever did, and can affect many more lives more easily than he could at the height of his physical powers. But no computer, no device, will ever replace the one-of-a-kind tools within us, which not only make us unique but also make us uniquely capable to participate in and reshape the world around us. It’s from the human mind, not electronics, that our greatest ideas spring, and it’s through them that we move furthest ahead when we most need to. As The Theory of Everything demonstrates, Stephen Hawking has known that for decades. And despite the plethora of challenges he’s faced, he’s never slowed down. Neither should we, if we want to not only touch the stars, but understand them. Matthew Murray is devoted to electronics (Managing editor of PC Magazine) yet, ‘It’s from the human mind, not electronics, that our greatest ideas spring.’ in his last paragraph of homage to a great scientist he recognizes that Hawking’s life was a matter of mind over body. Hawking’s mind kept him going, learning, discovering, writing, sharing knowledge. Those are all mind or mental attributes. Psyche is Greek for soul or spirit. Whenever scientists or doctors use the words ‘psyche…’ (psychosomatic, psychology, psychedelic, psychopath, psychosis,) or ‘cognitive’ you can substitute the concept ‘mind.’ If you think about it and how many fields incorporate these terms you begin to realize the role the ‘mind’ plays and just how much information there is floating around out there about the ‘mind.’ And, if you think about it, in this profusion of information, a lot of confusion of concepts, proposals, and treatments. We talked about the state of mental health. Psyche incorporates phenomena that reach into the very depth of each human being. Nothing is more profound than your and my feelings, attitudes, and emotions. Today, these manifestations of our psyche are often troubled as we refer to soul, spirit, (inner) self, innermost self, (inner) ego, true being, essential nature, life force, vital, force, inner man/woman, persona, identity, personality, individuality, make-up, subconscious, mind, intellect. All these terms are another way of talking about the psyche. Incredible technology has developed increasingly precise mapping of the brain, and it will only get even better and more detailed. Yet we still only recognize which regions of the brain are responsible for individual functions. And we realize more and more, as Dr. Lieff mentioned above regarding language that the brain acts as a whole. But, we have not located or identified where a specific memory, like your first infatuation or the love of your pet resides. Let alone where your moods of anger, jealousy, philanthropy, and sharing are located. We can scan the brain, we can’t scan the psyche. Everything your “immaterial” mind imagines leaves material traces. Each thought alters the physical state of your brain synapses. This immaterial, this psyche, this subconscious, these moods are what Descartes referred to when arguing that mind and brain are made of different substances and are governed by different laws. For him the brain was a physical and material, existing in space and obeying the laws of physics. Whereas the mind was immaterial, a thinking thing that did not take up space or obey physical laws. Thoughts, he argued were governed by the rules of reasoning, judgment and desires, not by the physical laws of cause and effect. Human beings consisted of this duality, this marriage of immaterial mind and material brain. But Descartes could never credibly explain how the immaterial mind could influence the material brain. Everything that lies in between is unknown to us, and the data do not include any direct relation between these two terminal points of our knowledge. If it existed, it would at the most afford an exact localization of the processes of consciousness and would give us no further help toward understanding them. The interface between the mental and the physical. This is a question you practically never hear anything about. If science can’t define mind how can it begin to decipher how the mind affects the body? Let me try to put this in down-to-earth terms using the computer as an example. It’s actually a good example because, although most of the population know what it is and use it, there’s an element that few really understand. There are three major elements to a computer and you must have all three for it to be of any use to a user. Hardware-the machine: keyboard/mouse for input, hard disk drive where the input/memory resides, screen for the output of the memory. A processor to accomplish the commands you give the computer and, of course, there are ears/microphone-speakers, eyes/video camera, mouth/printer etc. There are a hardware handler and coordinator of all these components and wouldn’t you know that we call it the motherboard. Why not the fatherboard? The operating system for the hardware. It tells the hardware what to do when it’s turned on, how to process and where to record data on the disks, how to recuperate it etc, We now have a touchscreen, it has to cause the machine to enact whatever your finger movement does. It makes sure all the hardware components integrate and complement each other. Application software for the human user. This is productivity–processing–software that allows you and me to write and create letters, books… record sound and images. calculate, draw, design, present, create databases, send messages, share. These processing programs allow each of us to express our creativity. All three parts must work together perfectly with no bugs. That’s the goal of a computer. Everyone knows there’s hardware, the first element, … they see the computer and screen, they turn it on and off. I see the production of my typing in the form of words or images I create to introduce each blog post. With regard to the application software–the third element–everyone learns and tries to become proficient in writing, calculating, creating graphics and recording voice or gaming, using programs designed for those purposes. But, you know what, a lot of people don’t pay any attention to the second element, the operating system, the INTERFACE between the machine and the user. Some barely know it even exists. Personally, when something goes wrong at that level, I’m at a loss. The interface is a highly complex program and it’s got to work perfectly so that the computer (1st element) seamlessly outputs what we key into (3rd element) the machine. Likewise with the interface between the mental and the physical, the mind and the brain, the conscious and the body. 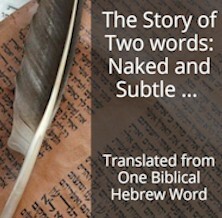 This subject is much bigger and has far more impact than most us begin to realize. Yet it is the crux of human existence. This is what stumped Descartes, this is what stumps scientists and philosophers who put their minds (hmm … put their minds) into thinking about this thorny issue. There are a lot of blanks to be filled in: We don’t know what the mind and consciousness really are and we don’t know the interface–the mechanism–that causes the mental to imprint on the physical. There’s a lot of explaining to be done. And yet the mind and consciousness are the base of everything human. Do you see how fundamental this piece of the puzzle is? The mind is plastic, you can change your mind. Just as the body and brain are. but why is the mind plastic? Hands are what accomplish the thoughts of the mind. I think about the contents of this blog and my hands type those thoughts on the keyboard, Why can only humans outwardly express not only their emotions, moods, and attitudes but also their creativity, ideas and imagination, whatever is on their mind? Horgan is saying you can do neither an Inventory nor an Audit of the Universe without all the pieces of the puzzle. And consciousness, the essence of humankind is such a major piece … it cannot be disregarded. That is why I’m writing The Explanation series. We shall return to this fundamental piece in the next few chapters and particularly in Origin of the Universe. We’ll see the origin of consciousness, how it works, its raison d’être and especially its relations to humankind. Consciousness–mind–is the capstone of everything in the Universe. Since you read all the way to here… you liked it. Please use the Social Network links just below to share this excerpt of Inventory of the Universe, Consciousness and Human Mind, You Can’t have One Without the Other.